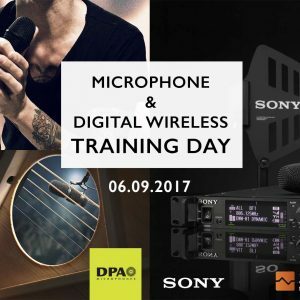 Sound Network is holding a microphone techniques and digital wireless training day on Wednesday the 6th September 2017 at its headquarters in Highgate Studios, London. UPDATE 31/08/2017: We’re at capacity for this event, so have closed registration. Don’t worry, there will be more! We’re already planning the next training day. Check out our events page where you can subscribe for email notifications of new upcoming events. The day will be split into two sessions, a Modern Microphone Techniques session at 11AM, and a Digital Wireless session at 2PM. The training is absolutely free to attend when you register below and we’re sure you will find one or both of the sessions to be a valuable supplement to your knowledge on the subject(s). The training will be presented by Les Mommsen. Les is a DPA Microphones master, digital wireless expert and head of sound at London’s prestigious Union Chapel venue. He is also currently an active live, corporate and mixing sound engineer with extensive experience in a wide range of venues and events. Aimed at live, corporate and installation sound engineers (both professionals and students are welcome), this session will teach you about modern microphone technology and how to use this to your full advantage, with a focus on the science and application of microphones. No matter the industry, you’ll know that bandwidth is becoming a precious commodity. This means squeezing more channels into less space. Find out how modern digital wireless systems achieve this while still providing reliability and exceptional sound quality. Also learn about how this technology can revolutionise your workflow, giving you one point of control over multiple transmitters and receivers at the click of a button. We’ve reached capacity for this event, so have closed registration.